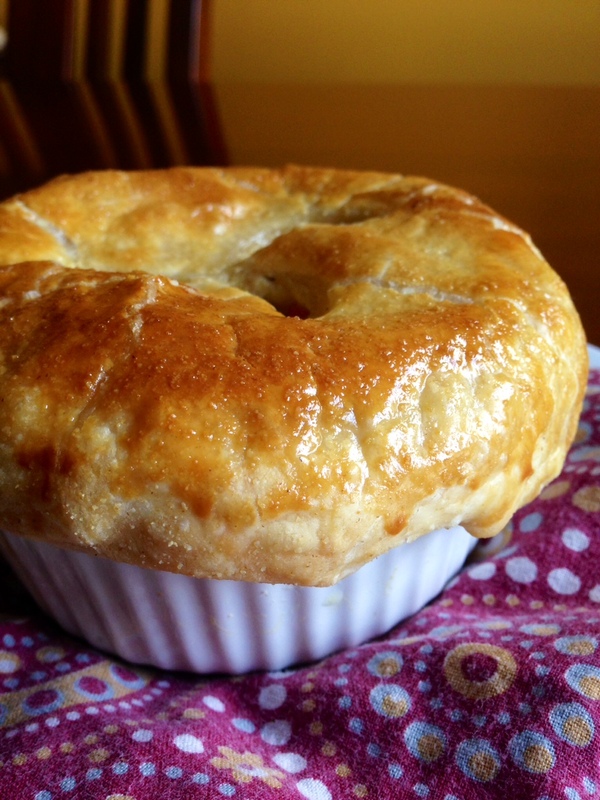 My friend, Lois, asked me if I could figure out a healthier version of chicken pot pie. I have to say it’s a bit of a challenge to replace all of the goodness in that ooey, gooey comfort food full of chicken and veggies floating in a rich, creamy sauce of butter and heavy cream underneath a crispy pastry shell. But it is possible. DIRECTIONS: First, remove the skin and bones from the roasted chicken, give the meat a rough chop and set aside. (Use just the breasts from two chickens if you want to make it extra healthy). 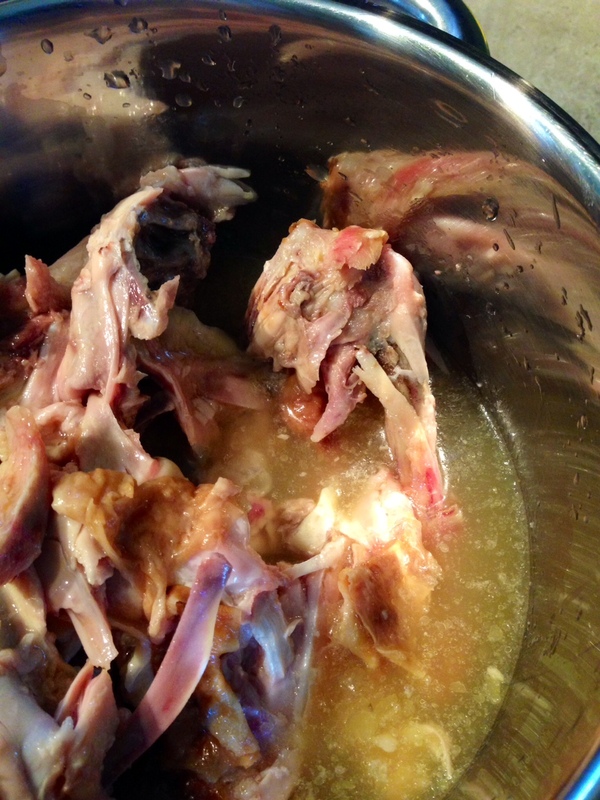 Put the chicken carcass in a small sauce pot and add just over two cups of chicken stock. Simmer for 30 minutes to infuse some extra chicken flavor into the broth. Trust me – it makes a difference. Strain and set aside. Remove puff pastry from freezer and thaw until you can unfold it. Sprinkle a board with oat flour and roll pastry just a bit to remove the seams and thin out a little bit. Next, add a couple tablespoons of olive oil to the bottom of a dutch oven or a large, deep saute pan. Saute onion, celery, carrots, parsnips, thyme and seasoning over medium/medium-high heat until the veggies become translucent and barely start to brown (about 5 minutes). Deglaze the pan with the brandy and stir for another minute. Sprinkle the oat flour on the veggies and stir for a minute or two. 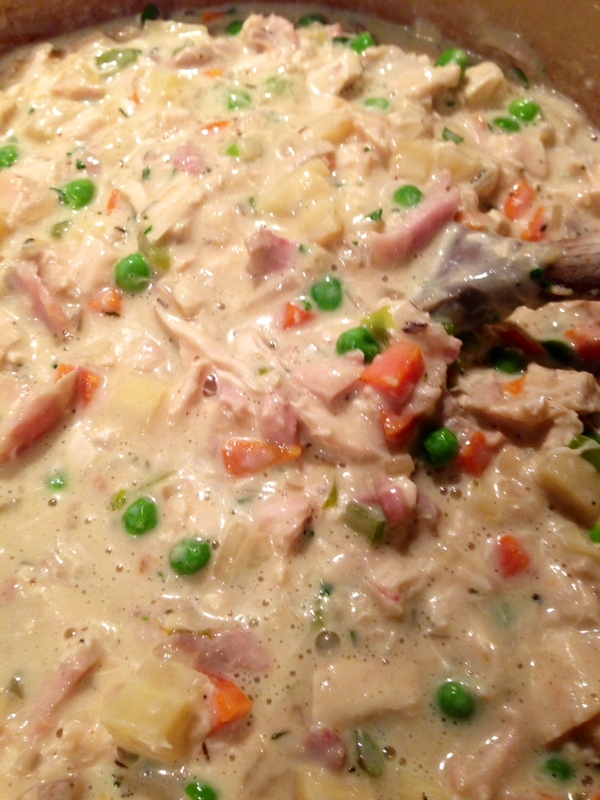 Slowly add the warm chicken stock to the veggies, whisking as it thickens to avoid lumps. Then add the goat milk, 1/2 block of cream cheese, peas, salt and pepper. Simmer on low for 5-10 minutes. Turn off heat. Whisk in greek yogurt; add chicken and parsley. Taste and re-season with salt and pepper if necessary. Divide mixture among 4 large or 6 smaller oven-safe bowls, mugs or ramekins (something that is deeper, rather than a long cassarole-shaped dish that would require more pastry to cover). 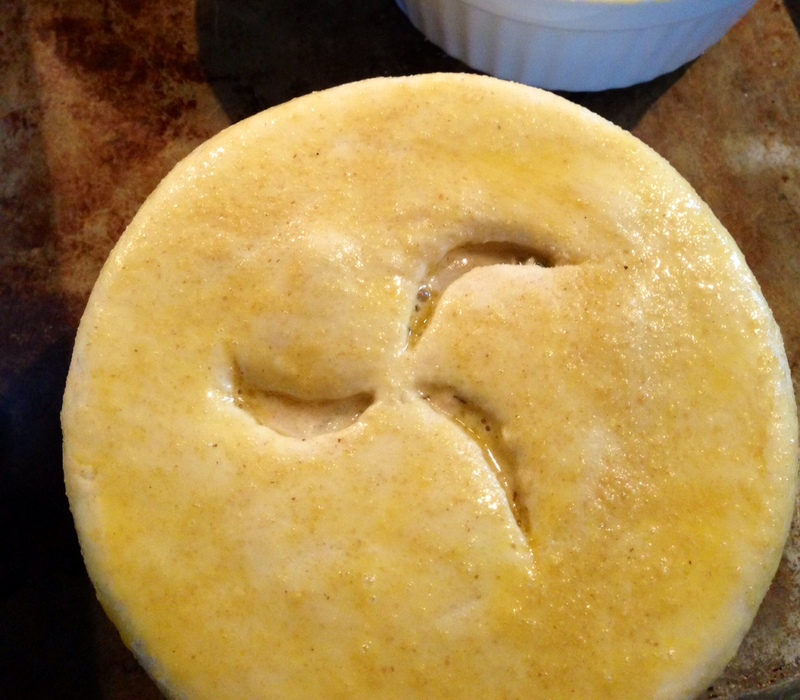 Whatever dish you use, flip it upside down on the pastry and cut out a shape slightly larger than your dish. Cover the filled dishes with the slightly oversized pastry and push it against the edges. Brush the pastry with the egg wash and using a knife, cut a couple of slits in the top to let the steam escape. 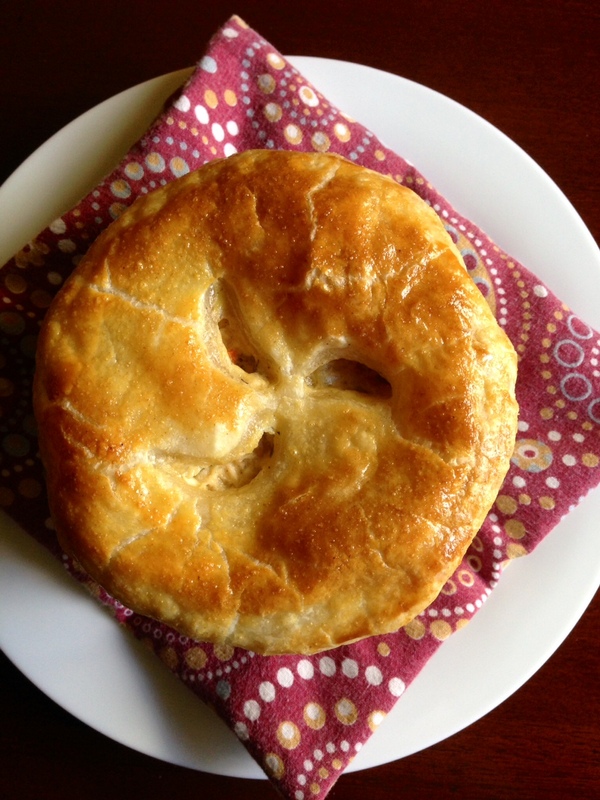 Bake the pot pies in a 425 degree oven for 30 minutes or until the pastry puffs up and turns a nice golden brown.